This blog post is kindly sponsored by Schlagfix, all thoughts and opinions are my own. 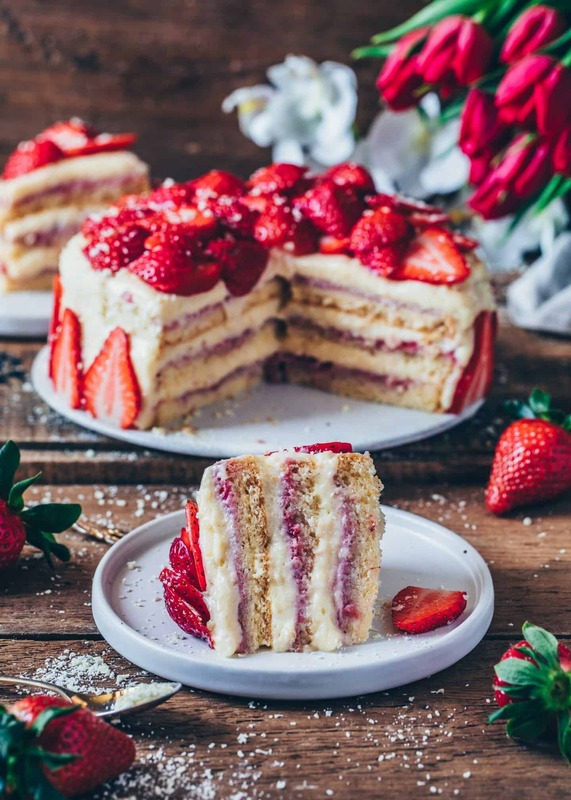 This strawberry cream cake really tastes sooooo heavenly that I could eat it every day for dessert! I have already baked it last year, so I couldn’t wait until the strawberry season started again. Since strawberries are now finally available, I was able to bake it again to share the recipe with you. 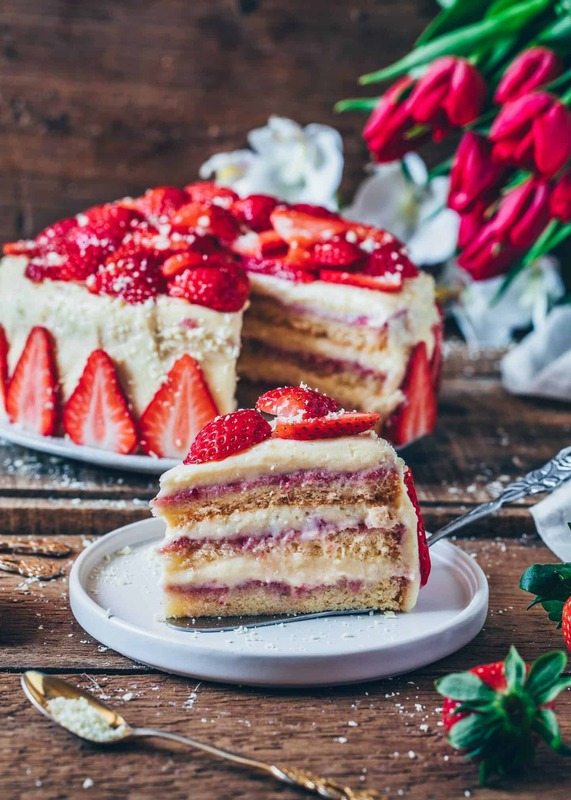 I think now is the perfect time, because, maybe you also would like to bake this delicious strawberry cake soon. Traditional fluffy cakes are usually made with lots of eggs, which make the cake light and airy. But with a few tricks and the right ingredients, it works just as well without eggs. Of course, the result will not be as fluffy as cakes made with regular eggs, but it is still possible to make egg-less airy cake layers. The vegan cake batter is also very easy and quickly mixed together. Thanks to the sparkling water, baking powder, and baking soda, it will also get nice and fluffy. Also, it is important not to overmix the dough, because stirring develops the gluten in the flour, which makes the cake dense. It’s totally okay if the dough looks a bit lumpy instead of super smooth. Furthermore, I recommend using a light flour, such as all-purpose or spelt flour and no heavy whole grain flour. 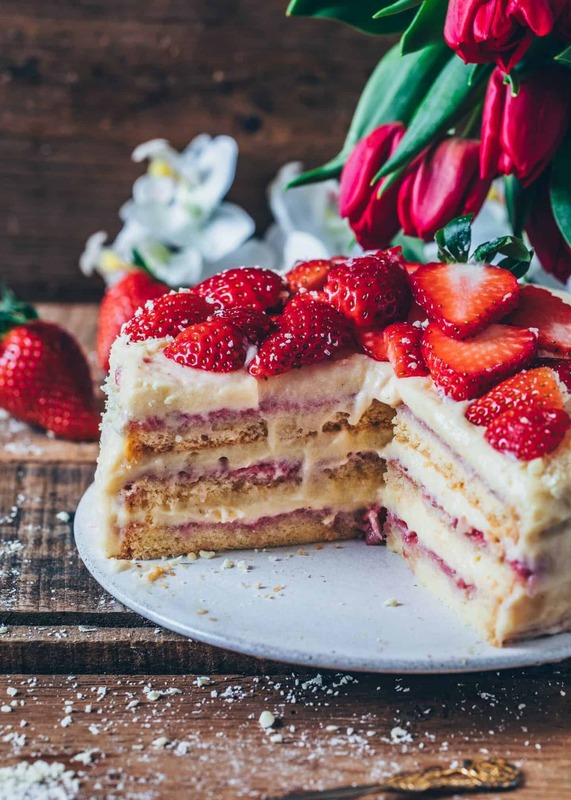 And if you want to make your strawberry cake gluten-free, you can use a gluten-free flour blend that can replace the regular flour 1:1. In addition, it is important that you do not overbake your cake, otherwise, it will get dry. Of course, you also shouldn’t bake it too short either. Equally important is the ideal oven temperature because if it is too low, the cake will not rise so well. For some ovens, the temperature is often not accurate. Therefore, I always recommend doing a cake test to check if the cake is done. If you insert a toothpick in the middle of your cake, it should come out clean. And if you touch the cake with your fingertips, the surface should spring back without leaving any visible fingerprints. To make the vegan vanilla cream, first, whip up non-dairy cream with sugar and vanilla and then fold in non-dairy mascarpone. 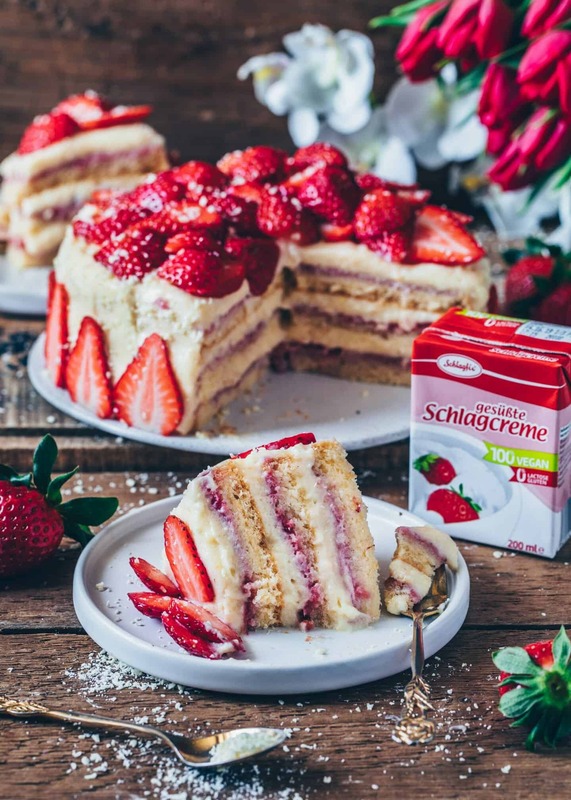 It gets super fluffy and creamy when using the vegan products from schlagfix which goes perfectly with the airy cake layer and the fresh strawberries. Last year, I made the vanilla cream with coconut cream and vegan cream cheese. It worked good as well, but to me, it seemed a bit too watery. Anyways, you can still try it if you want. 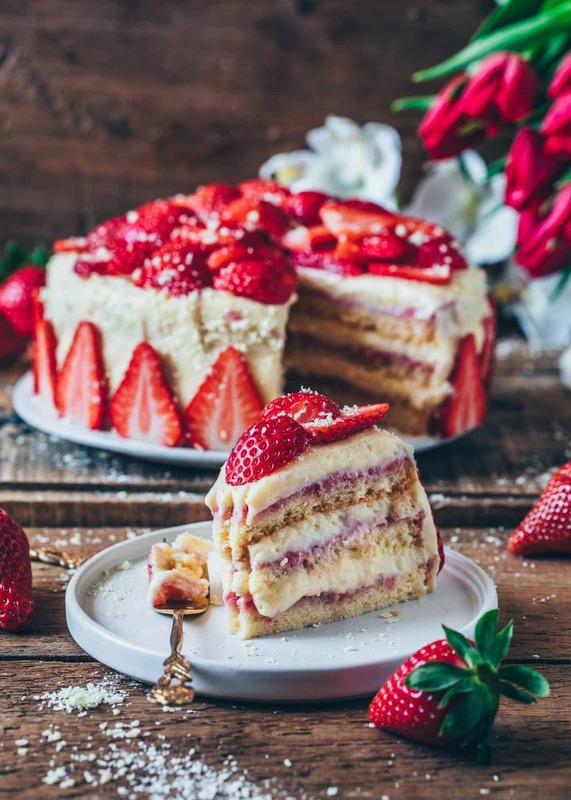 Between the cake layers and the vanilla cream, there are also pureed strawberries. 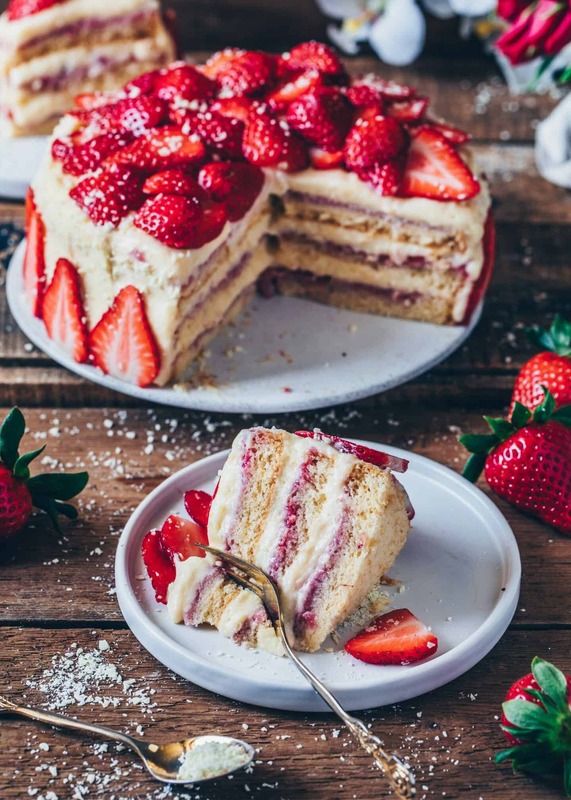 This makes the strawberry cream cake even tastier and also works great when using other fruits or compote. I think raspberries are also very delicious, and work quite well, especially because you can mash them easily. Also, I would like to try this cake with cherries or blueberries soon too! Perfect for the strawberry season! 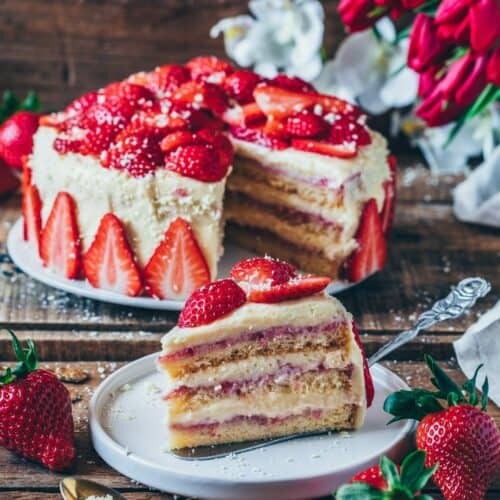 If you try this vegan strawberry cream cake or maybe another cake recipe, I would appreciate a comment if you liked it. Maybe you would also like to try my Vegan Lemon Blueberry Cake, Black Forest Cake, Peanut Butter Chocolate Cake or my Cranberry Vanilla Cake? Or maybe you’d rather try a refreshing no-bake strawberry cheesecake or a light puff pastry tart? Preheat oven to 355˚F (180˚C) and grease an 8-inch (20cm) cake pan. (You can line it additionally with parchment paper for easier removal). Sift the flour, cornstarch, baking powder, and baking soda into a large bowl. Add salt and sugar and whisk to combine. Add the oil, sparkling water, vanilla extract, lemon zest, and vinegar. Stir until just combined. (Please do not overmix or the cake will get dense instead of fluffy. It’s okay if the dough looks a bit lumpy instead of super smooth). Fill the dough into the prepared cake pan and bake for approx. 35 minutes, or until a toothpick inserted in the center comes out clean and the surface of the cake springs back when gently touched with your fingertips. Remove from the oven, allow to cool in the pan for 15 minutes. Then, carefully, invert onto a wire rack to cool completely. Add strawberries, powdered sugar and lemon juice to a blender and blend until smooth (or use an immersion blender). Split and scrape the vanilla bean. Mix the non-dairy mascarpone, powdered sugar, and vanilla with a handheld mixer until creamy. Set aside. In another bowl beat the non-dairy whipping cream until stiff. Then, carefully, fold in the creamy mascarpone. Cut the cake horizontally in three equal layers. Place one cake layer on a serving plate and, optionally, place a cake ring around. 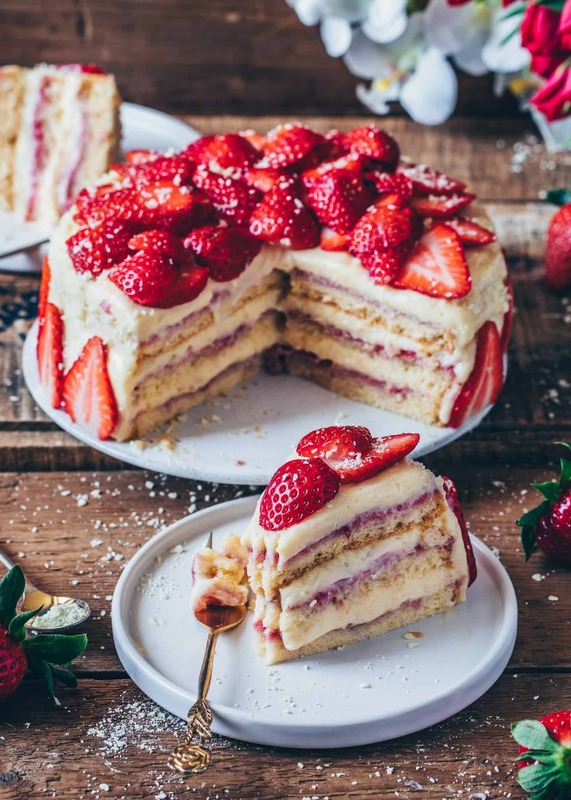 Spread 1/3 of the strawberry layer over the cake. Then spread 1/4 of the vanilla cream over it. Top with the next cake layer, another 1/3 of the strawberry layer, followed by another 1/4 of vanilla cream. Also, repeat for the third layer. Carefully, remove the cake ring, if using, and spread the remaining vanilla cream all over the cake and sides. Place your cake for at least 1 hour in the fridge to set before decorating and serving. 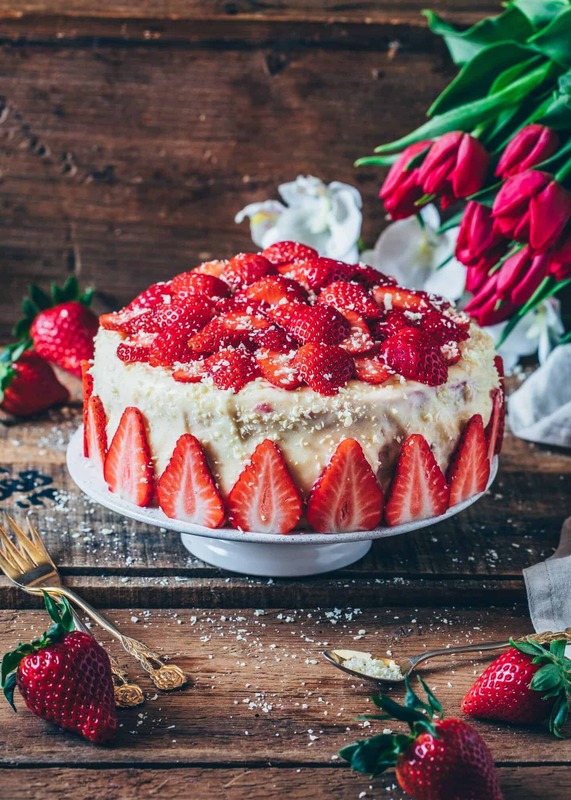 Decorate your cake with sliced strawberries and sprinkle over grated vegan white chocolate. If you don’t want to make the strawberry filling, you can use store-bought compote or jam. Also, other fruits are fine. The non-dairy mascarpone cream and whipping cream from Schlagfix are available in some supermarkets, or you can order them online. Hi ! This looks fab and super yummy. I would love to try this out but I don’t get non dairy whipping cream or mascarpone. Is there another option ? Can something like coconut cream be used ? Kindly let me knaw. 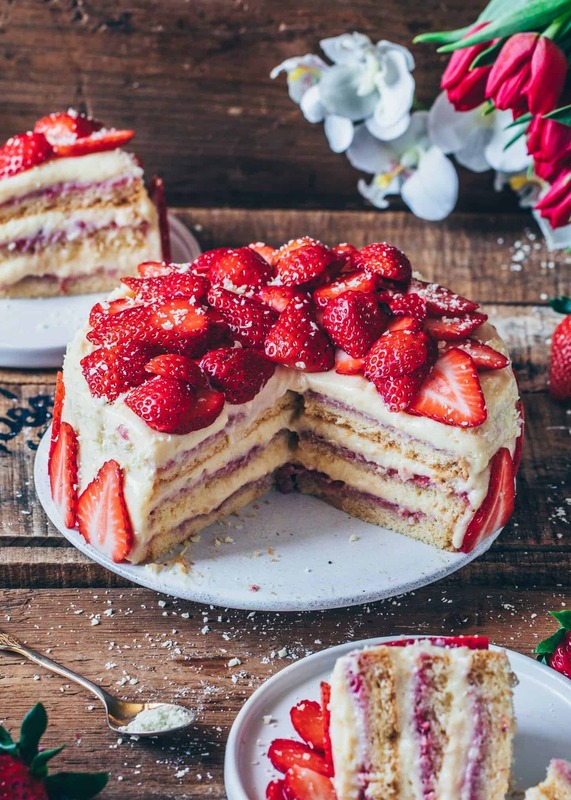 Wow, this strawberry cake looks so airy, fluffy and comforting! It’s beautiful, too. 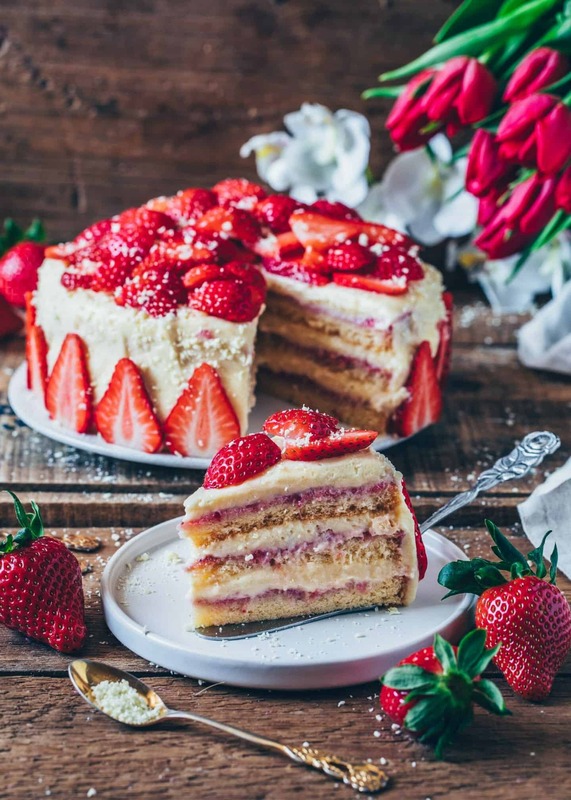 oh Bianca, this strawberry cake looks so so soooo beautiful!!! 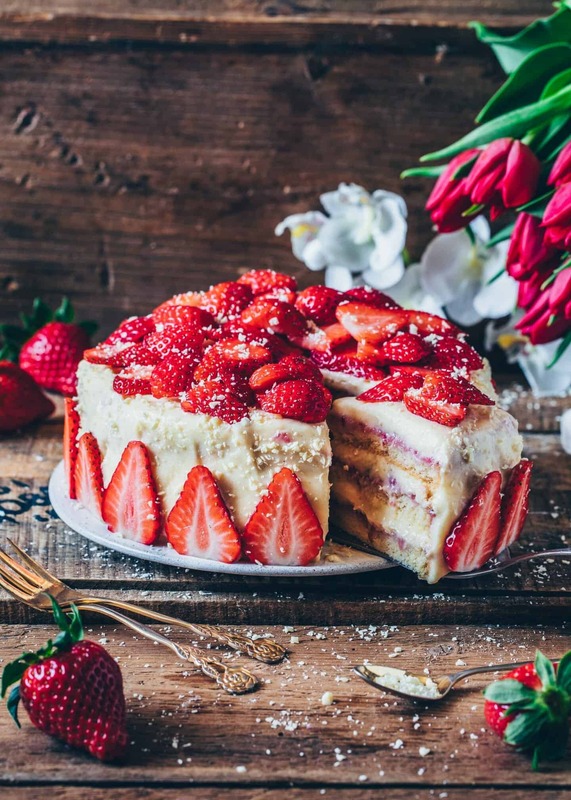 I’m so happy strawberries season is starting again,, so I can bake lovely cakes like this one!